You carefully put on your custom, Italian-made suit. Cinch up your pin-stripe tie. Shine your shoes. Place your fedora on your head. You walk up to the mirror. You are Don Draper. Your wife, Megan Draper, is just getting ready in the other room. Let’s change it up a bit. Maybe you’re Joan Harris and the dates out there for you are limitless. Or perhaps you’re Roger Sterling and you have many dates on each arm. Maybe you’re a Peggy Olson and you just want to have some drinks with the girls. The names are from the hit show “Mad Men”. The times are set in the 1960s New York setting. It’s 2012 now, so where would they go to feel comfortable and at home? At none other than the Vault, of course. 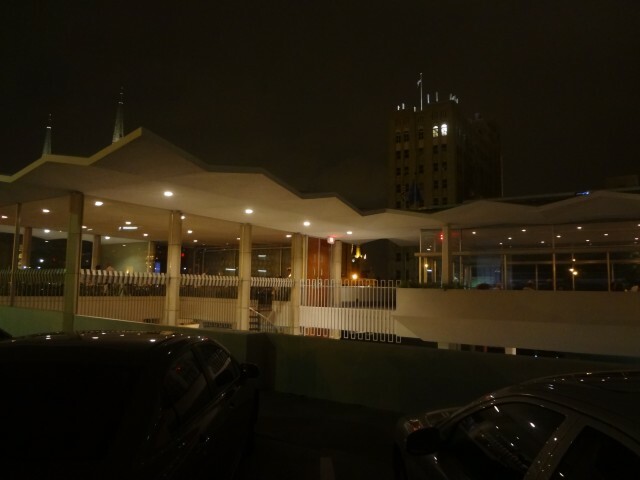 Located downtown at 620 S. Cincinatti, The Vault is a “mid-century modern” restaurant; two story; two bars; two dining areas; two parking areas. It used to be the First National Autobank, which opened in 1959. Keeping the feel, it still has original doors in place, spiral staircase (for employees only), elevator, and even the big, chunky, boxy surveillance cameras. The bank vault still resides in the building as well. Pastel blue and green chairs, white bubble chairs in the corners, long beige couch, white table tops, silver bar, brown bar, management wearing bow ties, waitresses wearing housewife aprons. Pretty rad setting. I called in for a reservation and was informed they don’t do reservations, but they can put my name on the list so I’d be next in line when I show at that time. Ok? The place is easy to find, as is the parking. Turning off 7th, we drove up the ramp into the parking lot. Exited the car and started for the restaurant. For a first timer, the setting is a bit confusing. There is one entrance and no host/hostess, I guess because this is the top level of the parking. How am I supposed to tell them I’ve shown up? I don’t know. But, being the place has tons of glass, you can easily see the Tom Tom room bar adjacent to this one. So, we worked our way around the upstairs dining area and towards the bar. I look down and I see another bar in the story below with a big dining area. Things look really poppin’ here. I asked a waitress about seating in the Tom Tom room and she said we could sit anywhere we like in this room, as long as we are 21, and someone would be with us shortly. After about 3-4 minutes of sitting, I was asked if I could leave this room, from what I assume is the manager, because apparently, the scattered empty tables in the room were reserved for a party of 18 (of which there were no signs on the tables either.) Funny, I thought they didn’t take reservations. I said I had a reservation too. So, he pointed towards the elevator, I guess we missed that in the corner, to make our way downstairs and said he’d meet us down at the main entrance. Out of the elevator, there lies the main entrance. I gave my name. Hmmm, they don’t seem to have me on the list of record that I called or anything. This is not going well. I just want to eat. We could sit at the bar or wait for a table. I chose bar out of desperation. We ordered a couple cocktails. They were ok. Definitely overpriced. 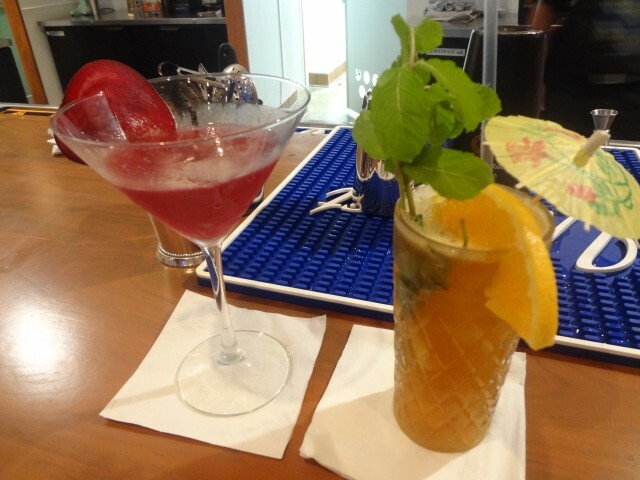 Also, the bar area was cluttered with bartender mixer glasses, fruits, herbs, drain mats, etc. All in our area. Every time one of the bartenders needed to make a drink, we had to sort our glasses out of the way, or risk getting other peoples drinks accidentally squirted into our area, drinks, and food. Not cool. They do have Marshalls and Coop beers though. Gotta love that! 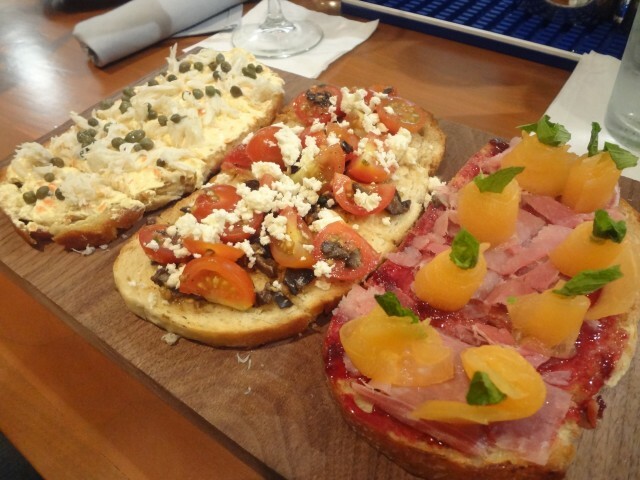 We ordered the bruschetta 3ways for a starter. Cream, crab, and capers on one. Traditional tomato, basil, olives, and feta on another. And chef’s choice for the other. $14 is steep for an appetizer. But it was delicious. 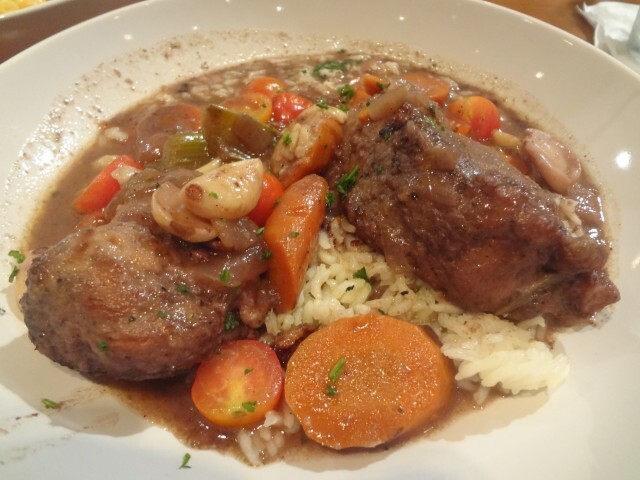 The pork bourguignon ($16) was great. So tender, you didn’t need a knife. Wrapped in warm spices, tomatoes, carrots, onions, whole cloves of garlic, and rice. 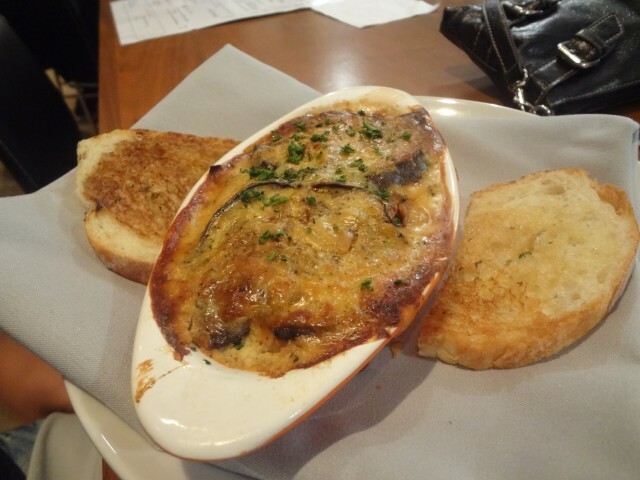 The moussaka ($14) was very different with garbonzo beans, mushrooms, lentils, tomatoes, etc. The flavors collided and melded together very nicely. 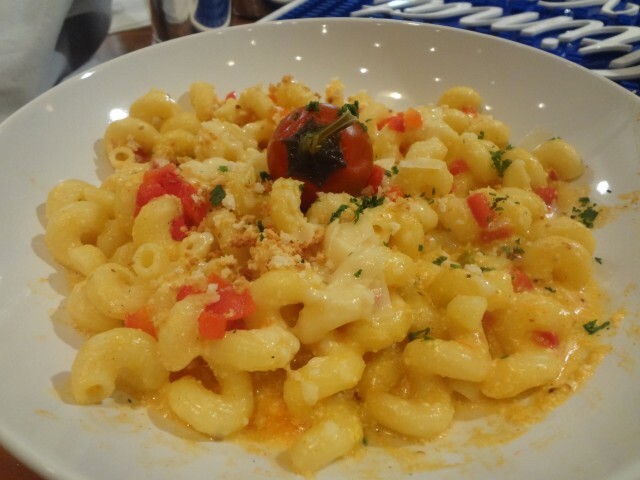 We even got to try the pimento mac’n’cheese which can be ordered as an entree ($11) or side ($6). It was ok. Though, I don’t think I could make it a whole entree. Overall, the experience was terrible. At least the food was great. The cocktails, in my opinion, are just ok and overpriced.The management definitely needs work. Hopefully they get these kinks worked out soon. It is, after all, a new restaurant. If I was Don Draper though, then Megan and I would have been out the door at the start.